Clear your schedules and count up your vacation days, everyone: A massive virtual reality theme park is opening next month in Guiyang, China. The park, called the East Valley of Science and Fantasy, was designed to be a science fiction world. The park site says it will include VR recreation halls, movie theaters, restaurants, and a children’s area. 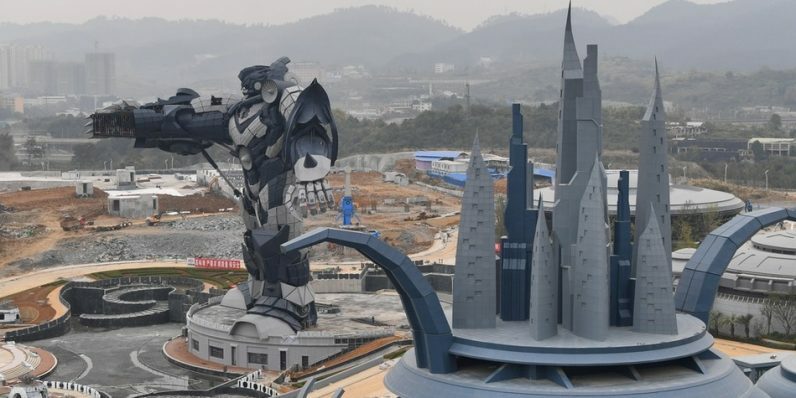 Images of the park leaked online a few weeks ago, showing a 174-foot mecha statue and several buildings that look like alien motherships. Overall, the park seems as though it’ll be pretty impressive to look at through normal eyes, let alone a VR filter. It reportedly cost $1.5 billion to build. According to The Shanghaiist, the park will partially open next month. Visitors will be given a VR headset upon entering the park, through which they’ll be able to explore outer space, meet alien species, and ride a VR roller coaster. It’s not clear how much of that will be available from the start. Regardless, I’d be thrilled to try even one of these attractions — especially the VR roller coaster. Ticket booking can be found online, though I recommend you only try it if your Chinese isn’t as rusty as mine is.